As part of my research into Frankenmac, my homebuilt Mac clone, I stumbled across this page at Intel that lets you easily compare CPUs across generations. Just click the Processors button, then choose a family (Desktop), then choose a CPU family (7th Generation Intel Core i7). Click directly on a processor’s name to go to its data sheet, or click the Compare box to add it to a comparison. Select as many as you like; the final layout includes horizontal scrolling to display those that don’t fit onscreen at first. I found this site useful when selecting a CPU for Frankenmac. 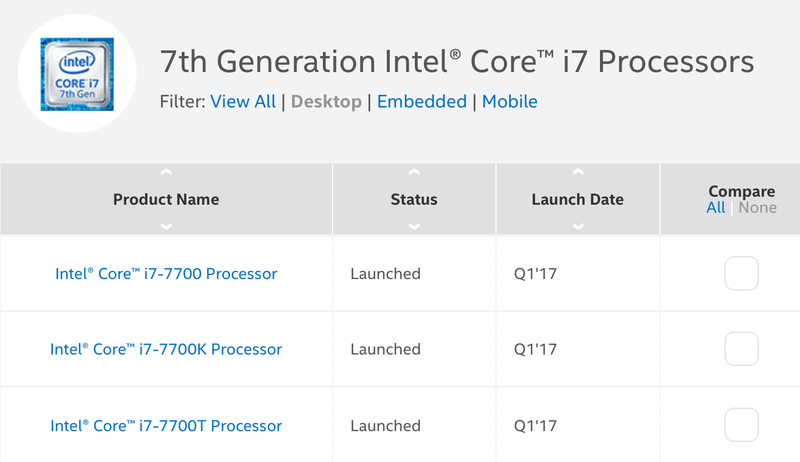 Comparing the 6th and 7th generation Core i7, for example, the 7th generation has a slightly faster clock speed, faster RAM, and support for Intel Optane memory, whatever that might be. Based on these mild differences, and on Apple not yet shipping a Mac with the 7th generation chip in it, I chose the 6th generation Core i7 for Frankenmac. They’ve reorganized it a bit (the Family bit seems to have gone away), but it works as described other than that.